I just acquired what appears to be a hand-made bowl and female figure which stands free inside or beside the bowl (one's choice). It is signed (bowl only) Wai Ming HK. The bowl has a base/support beneath, with birds and either flowers (disc shaped) and round pierced shafts (like asparagus) forming two open "flowers" at bowl's top. 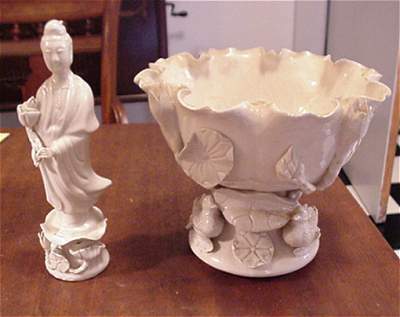 The bowl and female figure are white glazed porcelain. The female figure has the same "flowers" on her base. Her hands are finely articulated, with arms holding one of these plants/flowers. It appears to be handmade and very delicate. Bowl top edge is hand-crimped . Can you tell me anything about this set? Your pieces are of a type called "Blanc-de-Chine". Most probably they are both from the 20th century and marked "Wai Ming" by the importer in Hong Kong. The flower leafs you are mentioning are of a lotus referring to Buddhism where the Lotus has an important symbolic role as the container of all wisdom. A more specific date then "20th century" is next to impossibly to give. The lotus leaf shaped bowl is of a new and inventive shape though, which is no problem to recognize, but the female figure if it had not belonged to the bowl, is a traditional Guanjin goddess which would have been very hard to tell apart from her 18th century counterparts. Porcelain figures of this white ware originally came from the porcelain potteries in Dehua, Fujian province, north of the trade harbor city of Canton, along the South Chinese coast. Most of the Hong merchants who dealt with the Westerners in Canton during the 17th to the mid 19th century, were natives of the Fujian province and run their business all year long trading in tea silk and porcelain. This white porcelain ware from their home province therefore early came to be a popular trade item, later to be copied by the much bigger porcelain city of Jingdezhen. The porcelain paste of Fujian is slightly different from the Jingdezhen clay. First of all it does not take on blue pigments as easily as the Jingdezhen paste, which made the Dehua potteries specialize in white wares in the first place. The Fujian paste also seems to melt in a different way while fired thus it could take on a slight gloss without actually being glazed. If you yourself take a look at some unglazed parts inside the pieces, and the paste looks dull and dry, it is then most probably a Jingdezhen ware.